I finished up a second Astra Militarum Special Weapon (Sniper) Squad for my Tallarn forces this week. This was, admittedly, a bit of silly thing to do as not only do I have two other special weapon squads - one of the ones I already have is a sniper squad. There is no logical reason for me to have done these. I just did. 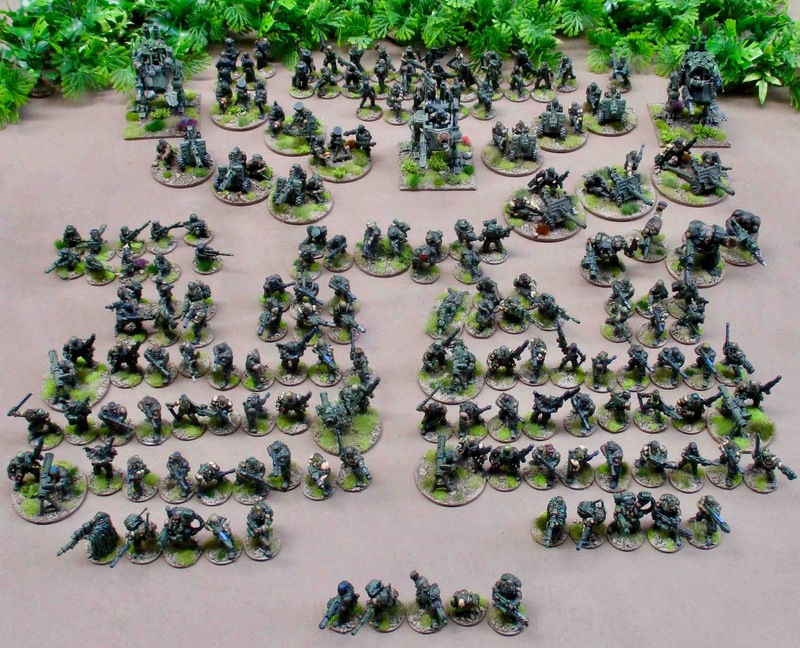 I should probably get working on some bog standard Infantry Squads. Here are all the infantry elements of the Tallarn force so far. I do also have a single roughrider that I forgot to bring out for the picture. Actually I should get on with some of those Space Hulk miniatures. I don't work well with "should"s though. I have a unit of nine Tallarn Roughriders on my painting desk. I started out doing them as a group, but then finished up this one just to see how it would turn out. They originally came on some crazy long narrow bases - that were rounded at the end. I didn't like the look of them and decided to go with round ones. 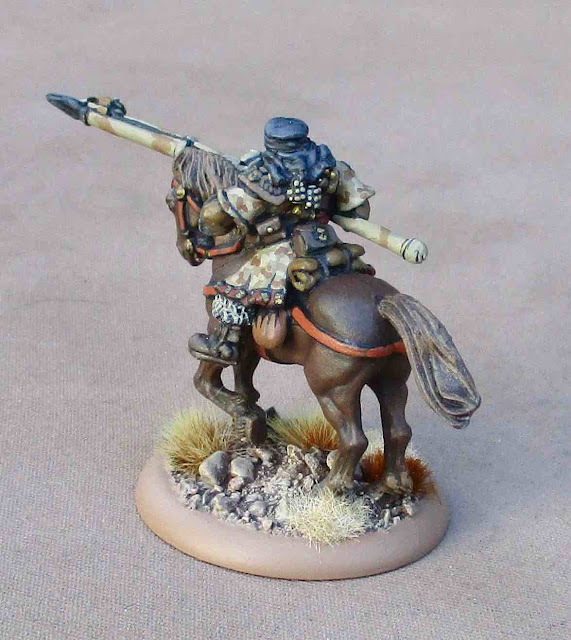 Though I normally base my guys on washers, I'd previously based a GW plastic horse on one of these rounded plastic bases and didn't mind it so much, so I've gone with those instead. With the ones they came with I could probably pack them into a single tight line abreast and get more into direct contact with anyone they charged, but the close combat rules say as long as they're within 1" of another model that is within 1" of the enemy they can participate, so I'm not worried about the base making it harder to get into combat. Originally I'd envisioned converting them so they'd be festooned with kit - like WW2 Desert SAS jeeps - but on horseback. But when I actually got to working on these I realized a lot of what I'd like to do would interfere with the tails of their smack. In the end I just added a couple small bags, rolls, or waterskis to each. While I have another eight of these on the workbench, I may shuffle them to the side momentarily as they wait the arrived of another lot of Tallarn I picked up... yeah... ANOTHER one - and this one is almost as big as the last one and will basically double the size of the force I will have (because apparently I didn't have enough already!?). 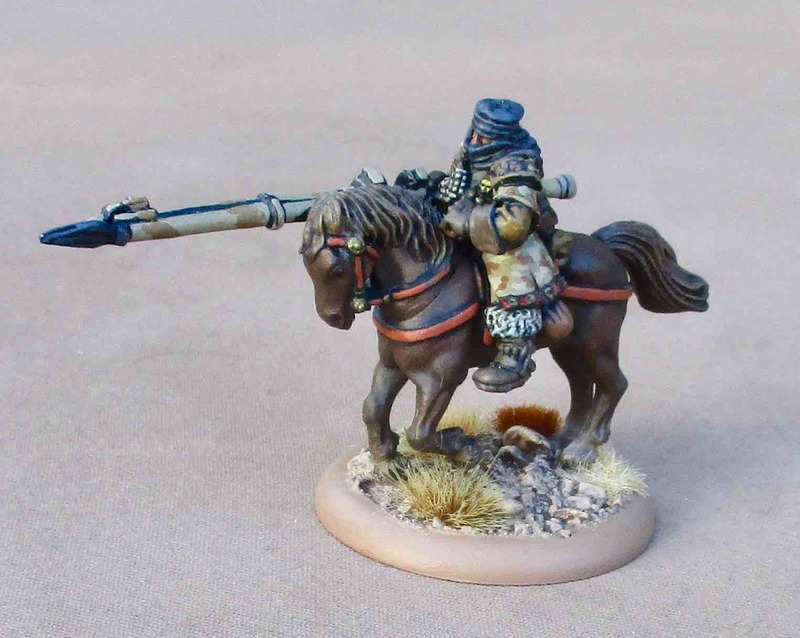 With the new batch I should be able to put together four platoons of four infantry squads, TWO units of 10 roughriders - each with an actual sergeant figure (so, waiting on that sergeant before I finish these) and adding a pile more heavy weapon teams - including NINE mortar!? Maybe I should get some of the Genestealers done while I'm waiting...? Actually I'll probably finish up Sniper Section #2 - as I have only two figures to paint to finish it up. A meteorid slipped through the network of Imperial ships orbiting Brind's World. It had been noted on auspex, but figured to be a lifeless rock and small enough that it would burn up on entering the atmosphere. Indeed it lit up the sky as it came plummeting out of the heavens and streaked across the skies of Brind's World. It was even visible to the troops of #3 Commando, 222nd Guaiacan Commando Regiment that has recently been deployed to the surface. It did not completely burn up however. The wayward hiveship from Hivefleet Haemorrhoid made landfall over a thousand kilometres to the east of #3 commando's current area of operations. It crashed into the surface with a thunderous explosion that could be heard hundreds of kilometres away and levelled an area of the equatorial jungle at least 20 kilometres in diameter. Almost immediately the mob began to disgorge it's contents onto the world: swarms of Tyranids which skittered out in every direction. It was determined that the Tyranid Prime's name was Chcczkhch (sounds like someone with bronchitis clearing their throat) - to which Finnegan responded "Funny name, must be Greek!" (only I laughed...). Warlord traits were rolled for - Warboss Blitzagg got Tenacious Survivor and Tyranid Prime Chcczkhch got Legendary Fighter. The Field of Battle - again with the jungle ruins - ruins seem to feature pretty prominently amid the equatorial jungles of Brind's World. Who built these? Where did they go? 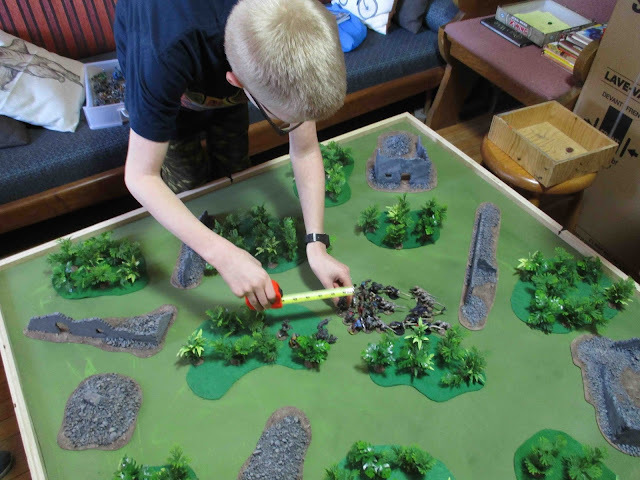 The Girl decided she didn't want to play today - she was more interested in getting some more figures painted (which we did do in the afternoon after the game!). 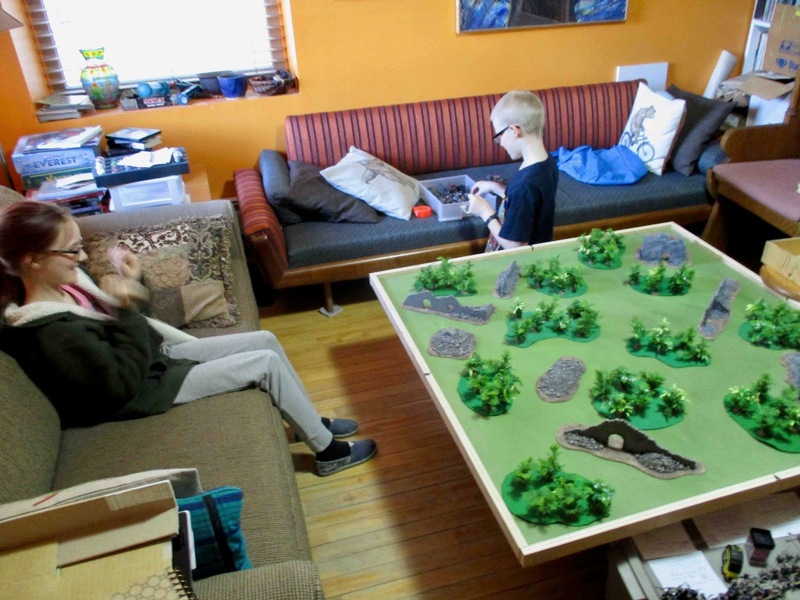 But she hung out and watched and cheered on her brother's Orks. 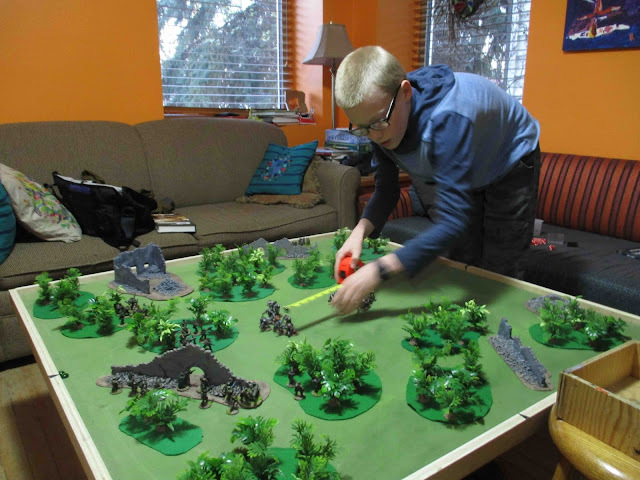 Finnegan deploying his mob go Orks. Horde of Termagaunts from Hivefleet Haemorrhoid. 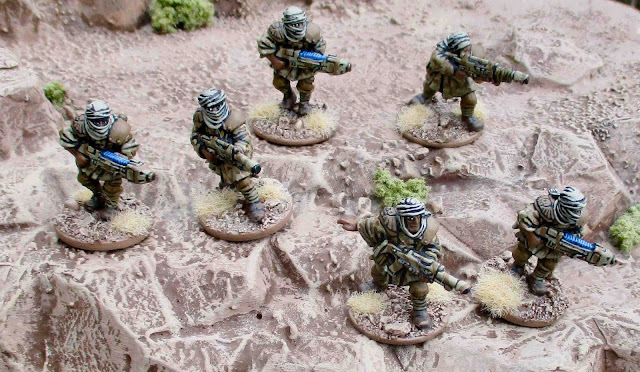 Lead elements of the patrol from Hivefleet Haemorrhoid. Overview of things, just before the sh!t got real. The Tyranids won the dice off and decided to take the first turn. 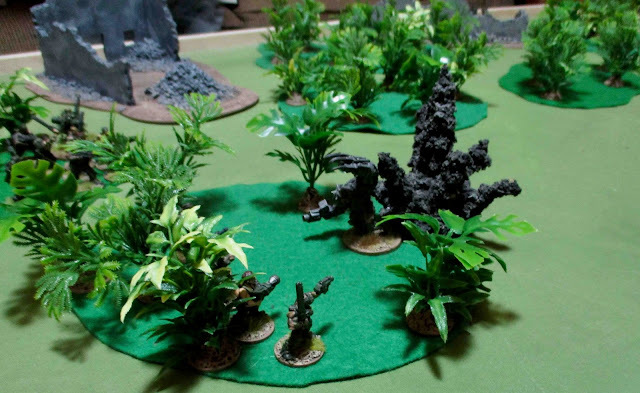 End of the Tyranid Turn - all moved and advanced - no shooting. 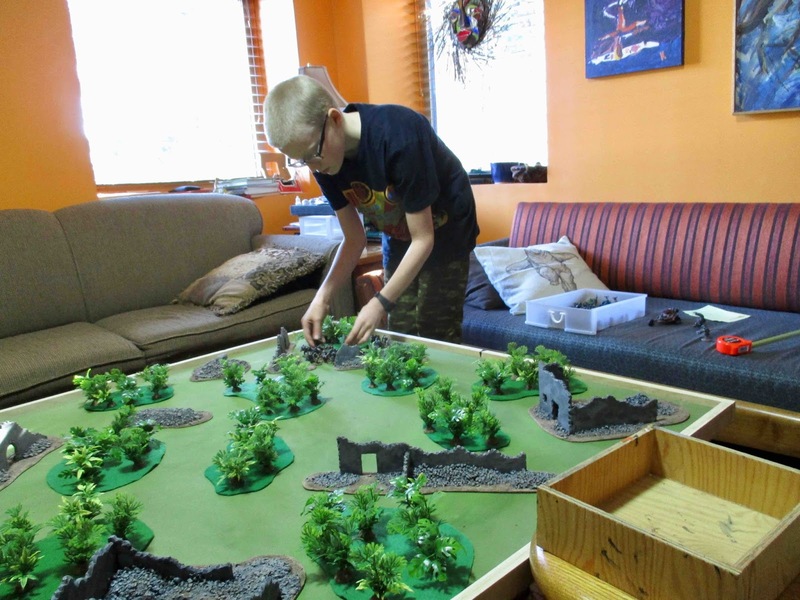 Finnegan starting to move the Orks out of the ruin they were hanging out in. 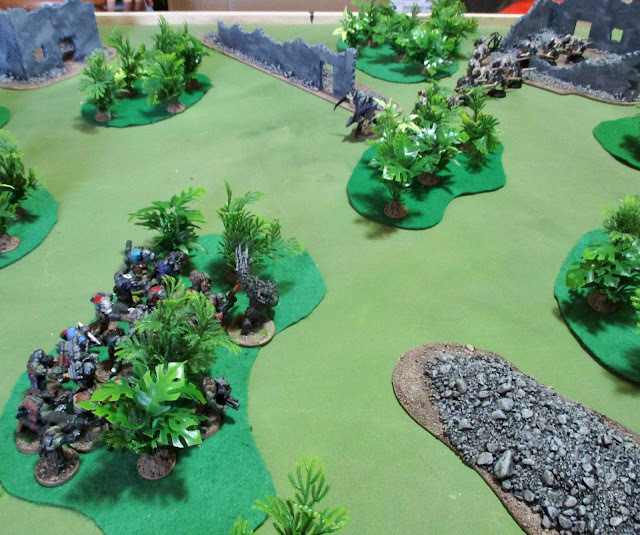 The Ork boyz and Warboss Blitzagg, having advanced out of the ruin and into a stand of trees they could barely make out the advancing enemy and so all began shooting. Round two saw the arrival of the two Tyranid Warriors from reserve. They lumbered onto the table, but could not spot any enemy to charge or shoot at. Meanwhile the Tyranid Prime, leading the horde of Termagaunts, continued it's advance. 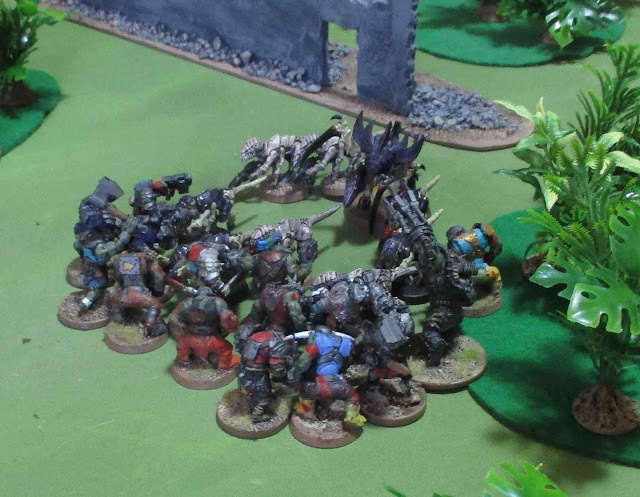 Seeing the Hormogaunts disappear into the woods and hearing their the sounds of their demise at the hands of their bother orks, Wazdigg set off in search of other prey. 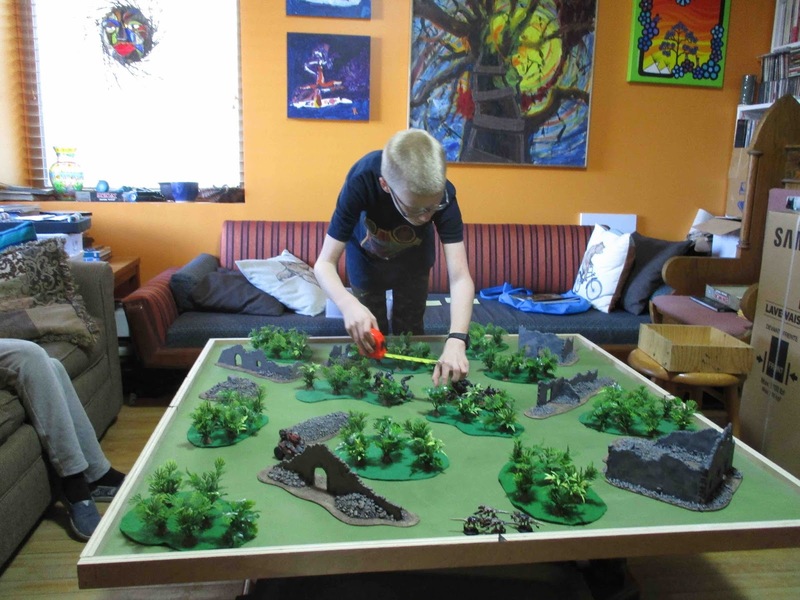 His driver pulled a few doughnuts, spitting up turf and showering the trees with dirt and brought them around to face the advancing Tyranid Warriors. Again, Wazdigg, to his own delight, launched rockets off into the jungle destroying much flora, but leaving the Tyrannids completely untouched. Chcczkhch, Tyranid Prime of Hivefleet Haemorrhoid, shuffled forward and spewed forth some biological atrocity into the surging mob of Orks, infecting (and ultimately killing) two of them. The Termagaunts caught up with their leader and also spit grossness into the woods, but the Orks were unaffected by this. The Tyranid Warriors skittered towards Wazdigg's War Buggy, which had finally screeched to a halt, and unleashed a torrent of venomous goo at Wazdigg! Though part of the buggy was splashed with the foul gunk (and would eventually cause some considerable corrosion), Wazdigg and his driver remained unharmed and the buggy remained in operation. On the Orks turn Wazdigg fired back at the Tyranid warriors, now that the buggy had halted his missiles were a bit more accurate and hit one of the warriors. 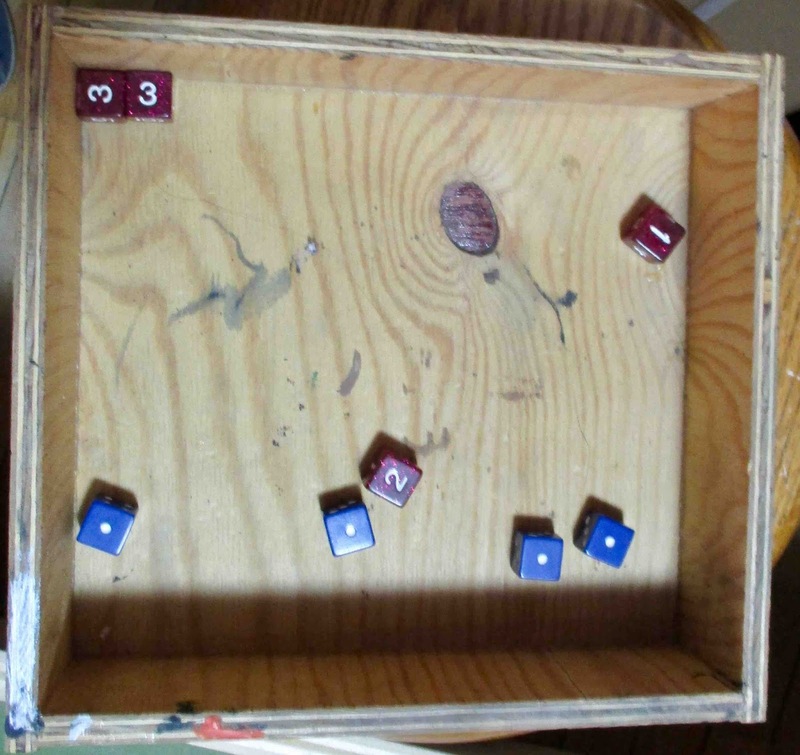 The initial wound roll failed, rolling a one. As it was 2+ to wound, Finnegan decided it was totally worth using a Command Point for a re-roll and succeeded. The Tyranids wasted two command points re-rolling saves... Tyranid warrior still died in an explosion of smoke and fire and pinkish-green goo. The Orks fired on the Termagaunts. The torrent of bullets took down SEVEN of them! The Tyranid Prime and Termagaunts returned fire and took out four more Orks. 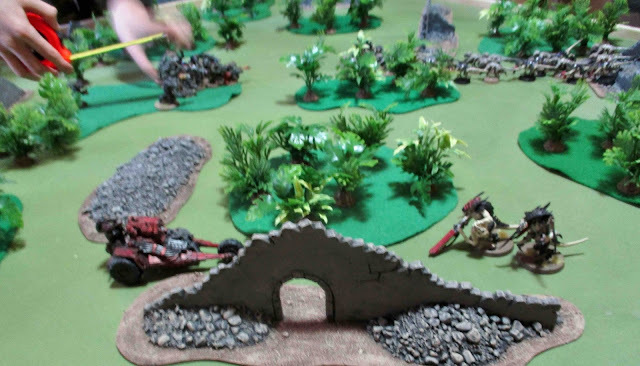 The Tyranid Warrior spouted another blast of venomous goo and it managed to eat through one of the tires (1 wound!) not that that ever slowed Wazdigg's War Buggy!? Wazdigg hit the remaining Tyranid Warrior with TWO missiles causing SIX WOUNDs blowing to bits. The Boyz unleashed another torrent of fire at the Termagaunts, killing another four and then charged in. Overwatch fire proved ineffective and the Orks overran and utterly destroyed the Termagaunts. 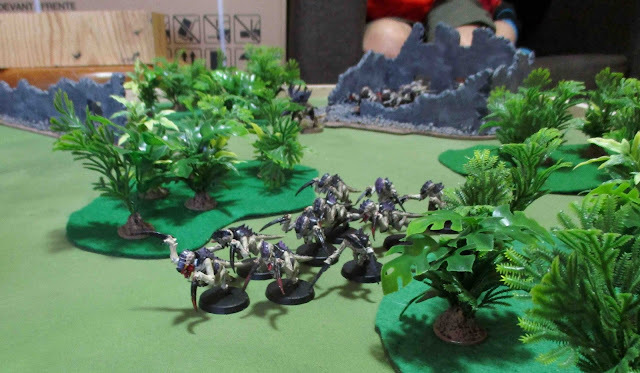 The Tyranid Prime, who had done a"heroic intervention" to enter the fray, used two command points to preform a counterattack - allowing it to attack before the next charging unit (Warboss Blitzagg). It's scything talons, slashed down FOUR Ork boys. Then Warboss Blitzagg took a chunk out of the Tyranid Prime with his Power Klaw. I did not expect that engagement to be quite so... one-sided... I had a feeling the Orks would come out on top, but still... Regardless, fun was had and everyone was still smiling at the end of the game and vowing vengeance. 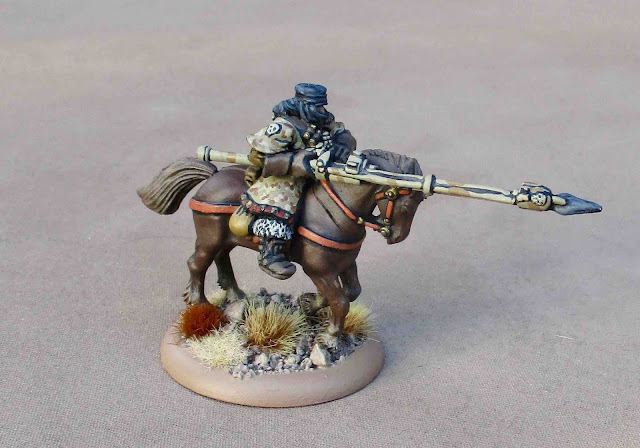 I have been working on some Tallarn Roughriders. I finished one as a sample and will hopefully get some pics up here soonish. I did take pictures of each unit in my (now completed!) Guaiacan Commando force, but most of them turned out pretty grainy and/or out of focus... I think I'm going to discard the lot of them and wait for a day with better lighting conditions to try again. 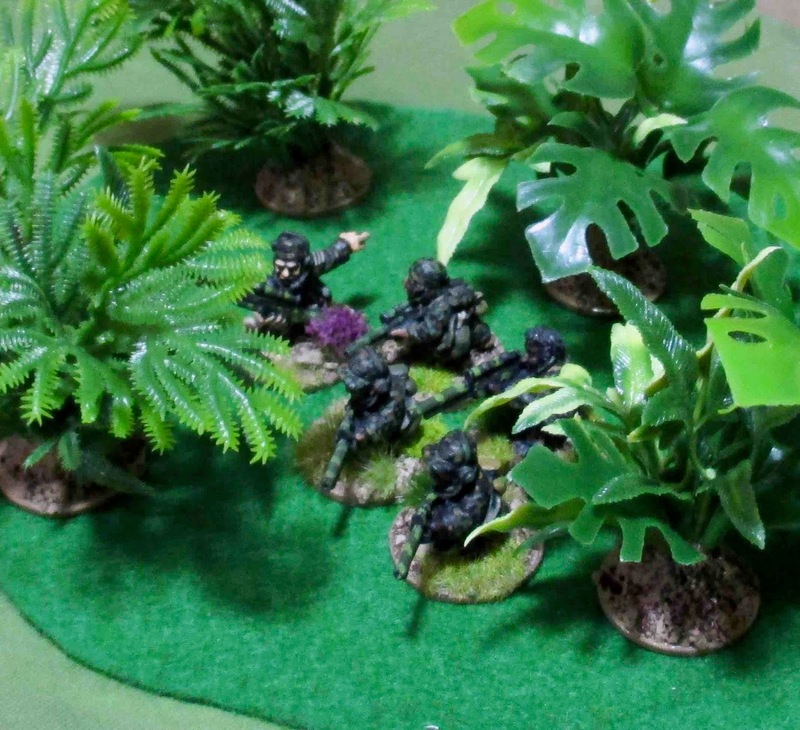 Just a quick post this morning - yesterday I finished up the last two heavy weapon teams for the Guaiacan Commandoes! Pictured there with a previously painted team, these are the very last figures I needed to paint to complete this force (well... for now...). Technically it WAS completed some time ago... but then Warhammer 40,000 8th edition came along and changed how everything was organized and the force required a bit of a reorg so I could field it as a "Brigade" detachment. Here's what the entire force looks like. 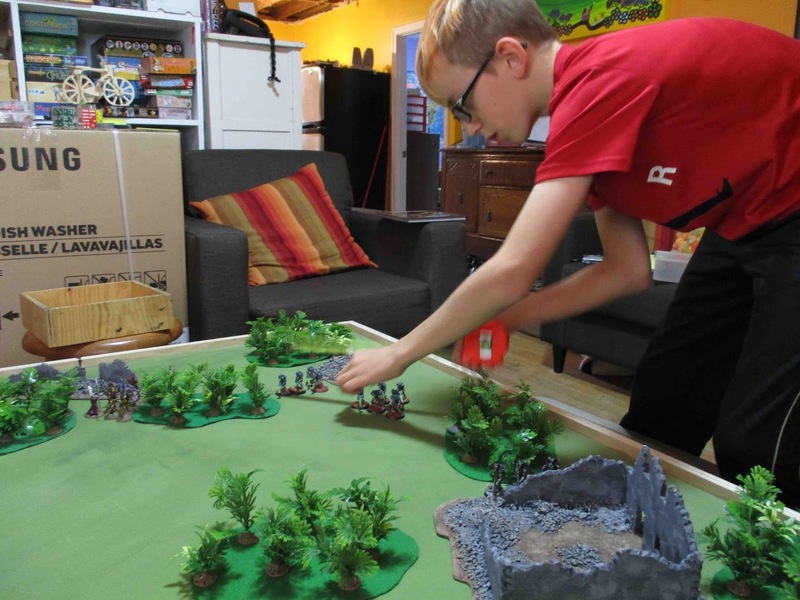 I'll be posting more new pictures of the entire force (along with a breakdown of what's in the force) at some point ( hopefully later today) as well as another battle report between Finnegan's Orks and his friends Tyranids! Finnegan and I played another game of 40K on Saturday afternoon. After the success of our smaller games on Thursday I wanted to strike again while the iron was hot and hopefully keep some momentum going... 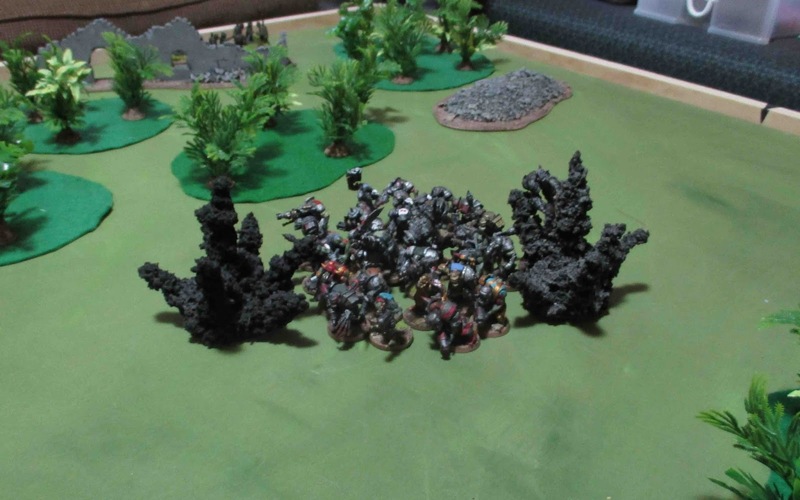 I was curious to see how the Orks would do as the defender in the ambush scenario - especially against a numerically superior force with weaker weapons lower strength and toughness (i.e. my Imperial Guard). Having seen the same orks utterly devastate The Girl's Eldar a few weeks back, I was a little frightened of them - could I pour on enough fire to reduce the mob before they got into close combat - because I was quite certain, if they DID get into close combat, that would be the end of my Guard! The colony on Brind's World is less than 100 years old. The world was brought back into the Imperial fold by Rogue Trader Gaius Armonius Brind in 946.M41. At the time it was described as habitable, but devoid of sentient life. A colony of only a few thousand souls was officially established in 952.M41. Over the next decade the colony grew steadily. The primary industry has been listed as "Primary Resource Extraction". In 959.M42 as a new settlement was established on a new continent it was discovered that the initial assessment of "devoid of sentient life" was incorrect. A large number of seemingly indigenous Orks lived on the continent and have been in a constant low-level guerrilla conflict of raiding and harassment ever since. As the colony didn't have the population to form a defence force large enough to deal with this threat, the Brind family, at their own expense, has regularly brought in off-world mercenary forces to protect the settlements. At one point the Imperial Navy was brought in to pinpoint the major Ork settlements and bombard them from orbit. Only a few surface settlements were discovered and they, and all land around them for 100Km were utterly destroyed. But the Orks continued to harass the colonists. Early in 017.M42 the Astra Telepathica received a distress cry from Brind's World - settlements had been overrun by Xenos. 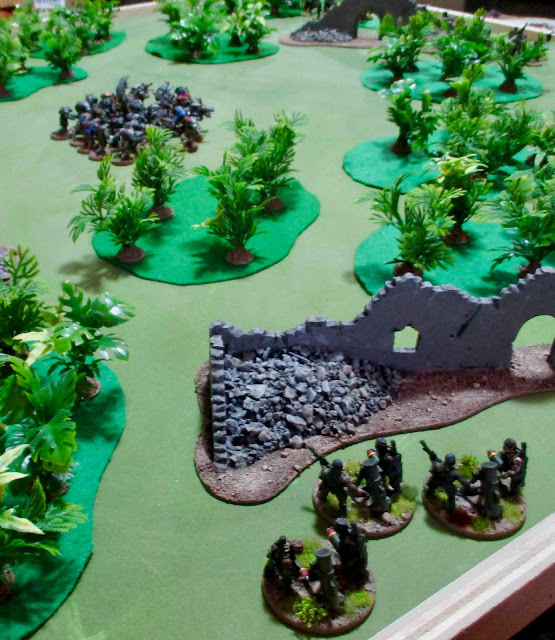 As the cogs of the great machine that is Adeptus Administratum began to grind to life and develop a response to this crisis, it was discovered that a fresh regiment of the Guaiacan Commandoes, ten thousand strong, had just been tithed to the Astra Militarum and were embarking on Imperial void ships ready for assignment to a war zone. As the Guaiacan system was in the same sector of the Segmentum Pacificus that Brind's World was located, they would be the first to respond. Others would follow. After a few months of travel, The 222nd Guaiacan Commando Regiment arrived in the Brind's World system around 668.017.M42. During the journey to the planet no contact was made with the colony's settlements. After settling in orbit no signals from the colonies could be heard. 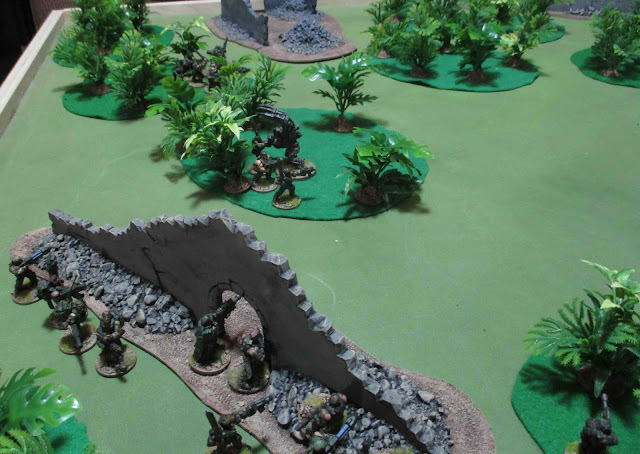 On 3.784.017.M42 elements of B Squadron, 4 Commando, 222nd Guaiacan Commando Regiment, under Captain Trent Marvos, were deployed to the surface to establish a firebase near one of the largest settlements on the planet. From there patrols could be sent out to reconnoitre the area and determine the fate of the colonists and the presence of any hostile xenos. On 786.017.M42 a distress signal was received from the dirtside force that they were being overrun by metallic armoured xenos. Captain Marvos' final signal was to fire on his position. A 50Km diameter region around the last know position of B Squadron, 4 Commando was levelled by an orbital bombardment. 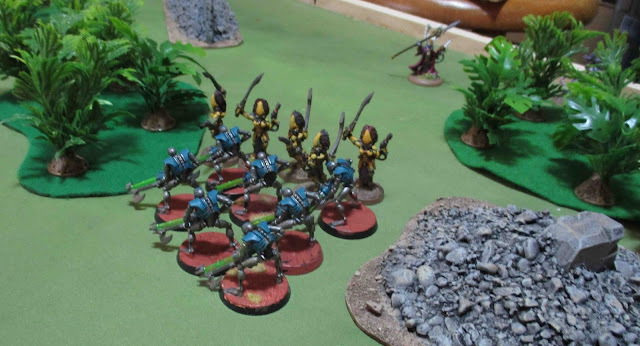 It was later concluded that these xenos were, in fact, Necrons! Thought there was still no contact with he colonists, renewed auspex sweeps determined that there was much activity on the surface, and possibly conflict between different xenos factions. Though the regiment was shaken by the loss of an entire squadron, It was determined that another force should be dispatched to the surface immediately - but in much greater strength. The entirely of #3 Commando was dropped en masse. Pickets were established widely around the area of operations to warn of any approaching xenos threats to prevent another disaster, such as that that befell B Squadron, 4 Commando. 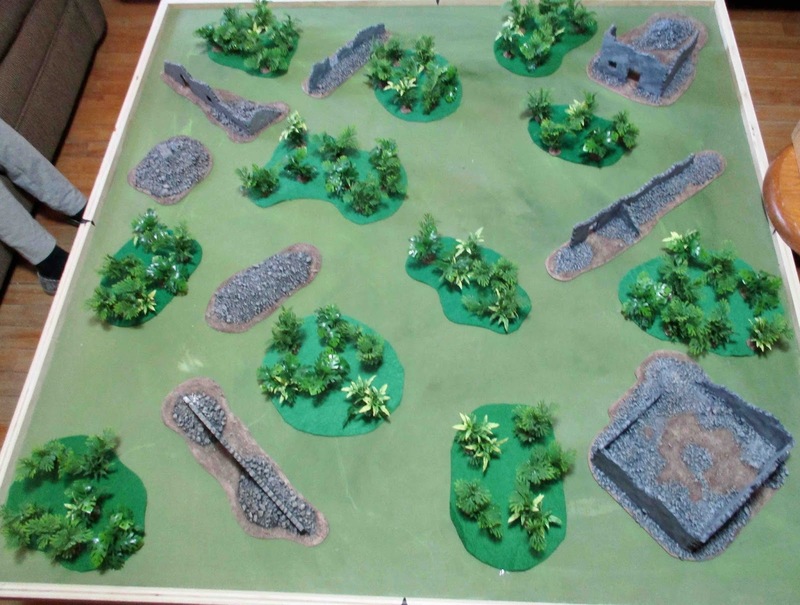 Patrol Detachment, 4 Command Points. As with the two previous games we played the Ambush Scenario straight out of the 8th Edition Core Rulebook. This time the Astra Militarum were the attackers and the Orks the Defenders. 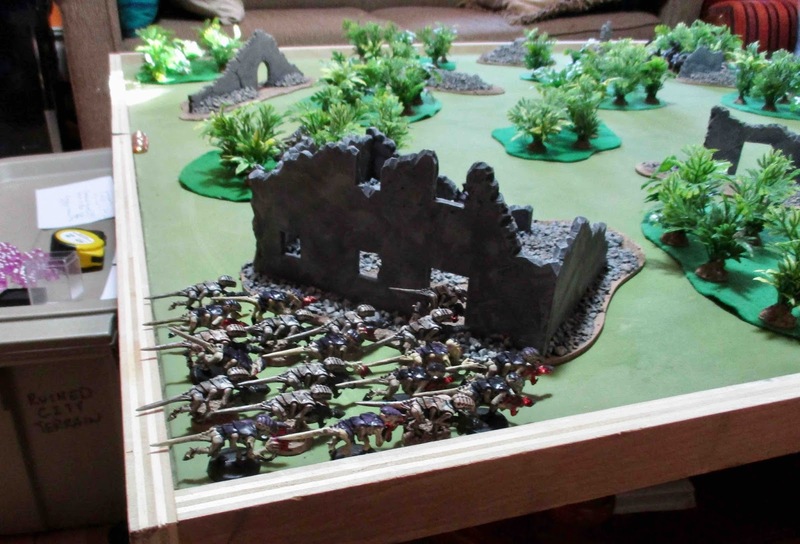 The Orks objective was to escape the ambush by exiting units off the opposite table edge. 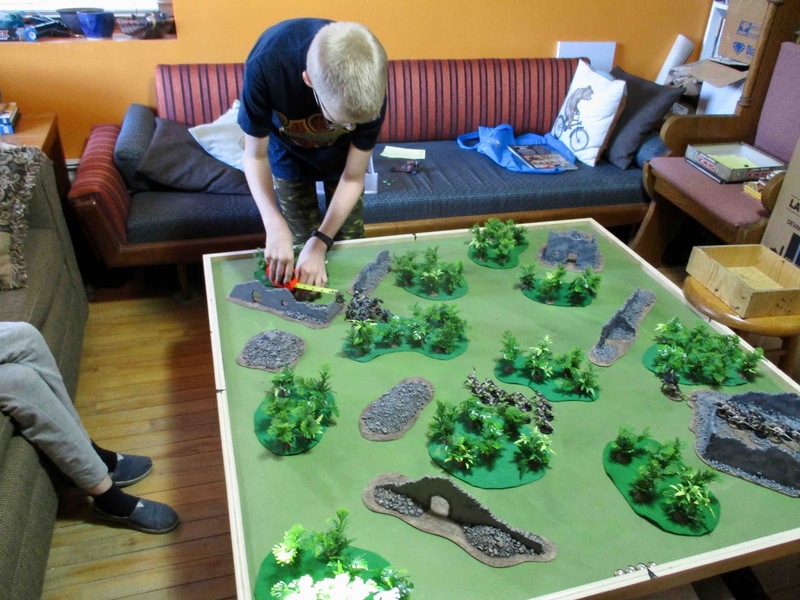 The Astra Militarum's objective was to prevent this. Finnegan setting up Warkurr's Mob in the kill zone of Lt. Roger's Ambush. Everyone all set up. 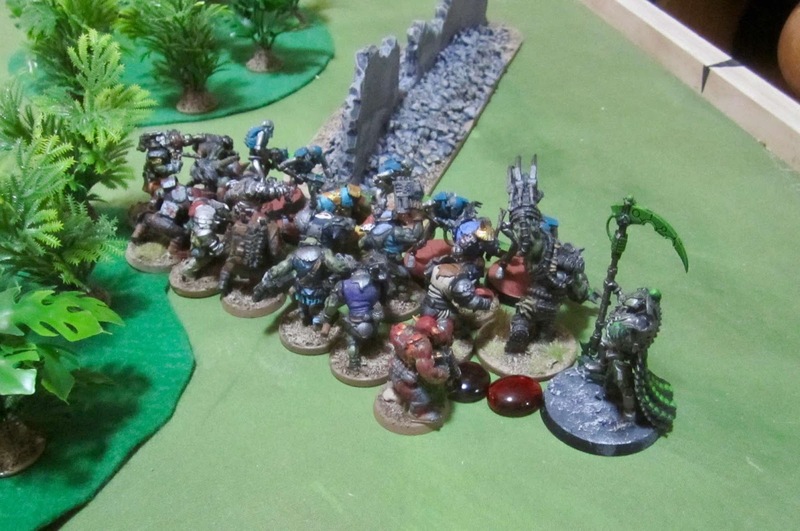 The orks set up as close to their escape route as possible. 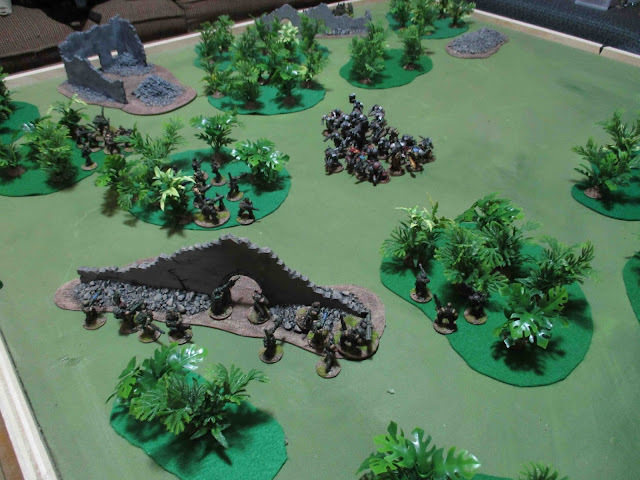 I set up three infantry squads and the command squad along the exit edge of the table and the ratings and mortars on the flanks - hoping they would be able to fire down on the Orks, but not likely be a target as the Orks just focused on getting the heck out of there. A Mortar section from the Commando's Support Squadron quickly set up in a ruin that gave them a secure position to fire from. Cpl. Daal, the section commander wondered at the ruins - they obviously weren't part of the colony - they were ancient. It didn't seem likely they were constructed by Orks either. He was sure in the briefings they had said when the planet was settled there had been no evidence of sentient life one the planet - but there was plenty of evidence everywhere they went...? Mortar team in position awaiting Lt. Rogers signal... The Ratlings also held their position while the three infantry squads moved forward into stands of trees to gain a firing position. 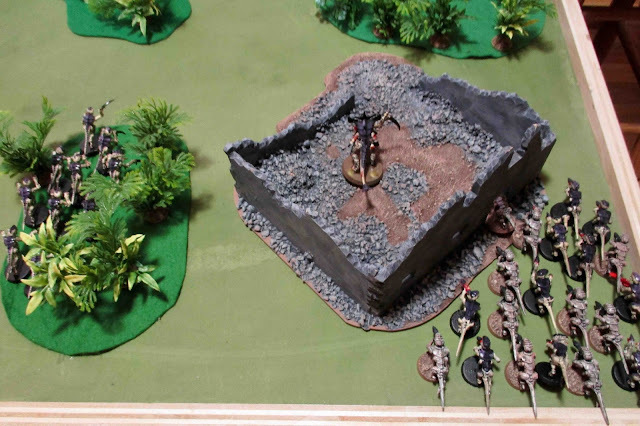 I spent two command points to give both the Ratings and the Mortar team Spectrum Enhanced Wargear -a stratagem foe this scenario that allows a unit to ignore the -1 to hit penalty due to darkness on the first turn. Drunk from their success against the "clankies", the Orks trundled forward. When the small ball of glowing green light (presaged by a soft popping noise in the distant woods) rose up above the tree canopy they all stared in dull wonder. Only Warboss Warkurr suspected something was amiss, but his troops stared blankly back as he roared at them. 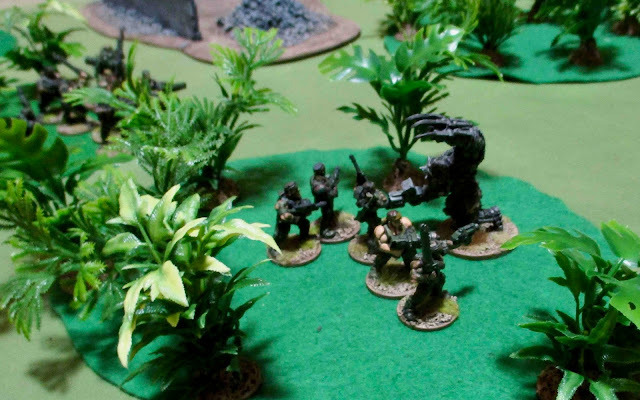 Only when the first mortar shell landed amongst them with a thunderous BANG, launching Orks - or parts of Orks - into the sat and showering the rest in dirt, shredded foliage, and black ichor of their mangled comrades, did the reality of the situation sink in. As the signal flare rose into the still half-dark sky, Sgt. Jack looked to his men, left and right, still, silent, determined and already lining up their first tartgets. He then pressed his eye to the rifles spectrum enhanced sight and lined up his own first target. Just as the first mortar round fell amongst them he gently squeezed the trigger, felt the shock of the recoil and watched as a small hole appeared on the near side of his target's head and could barely make out the spray as his head exploded out and away, showering those next to him with skull bits and brain. He continued to watch, not without some satisfaction, as the hulking brute slowly teetered and crumpled forward, gouts of black blood spurting out of his head. He then lined up his next shot. 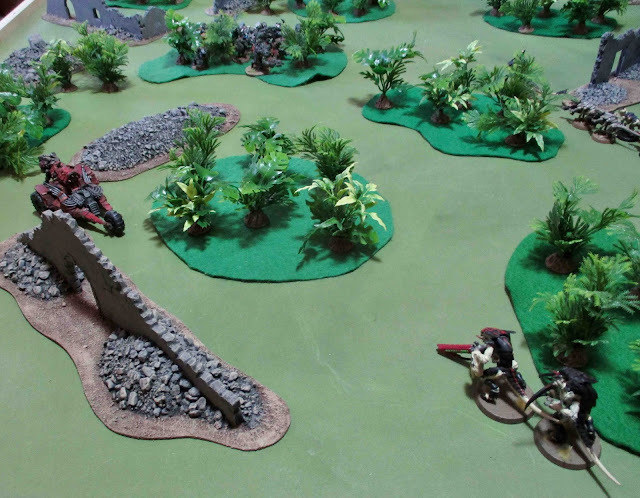 Trooper Gand, gunner for 2 Section's rocket team also launched his frag missile into the mass of Orks. There was a small flash as it detonated in their midst and showed them with metal fragments. More orks fell. Then the rest of the three sections opened up with everything they had. I realized at the end of the round I'd completely forgotten to issue any orders!? 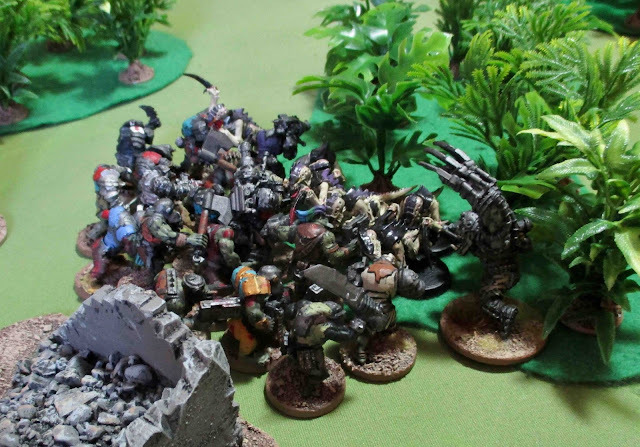 Despite the robustness of these massive hulking xenos, the weight of fire was telling one after the other fell as they rushed forward at their attackers! 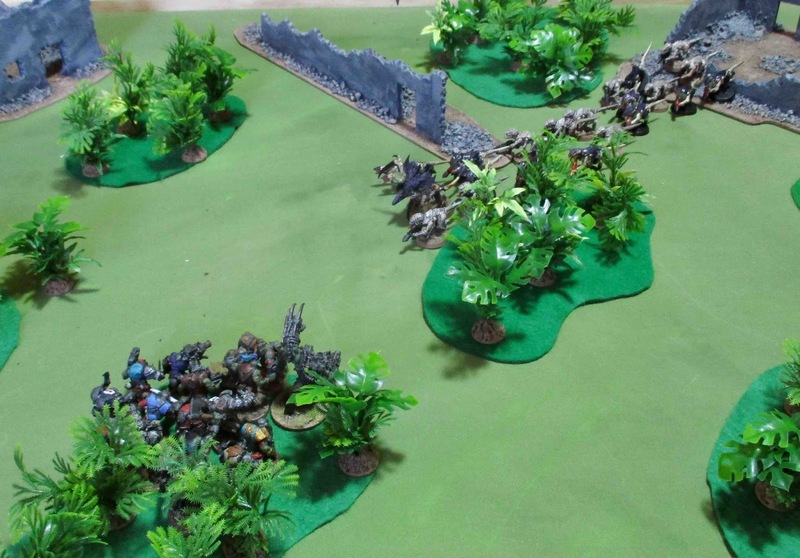 This turn was particularly brutal The Mortars claimed FOUR more and the railings another two. This time I remembered to use orders! 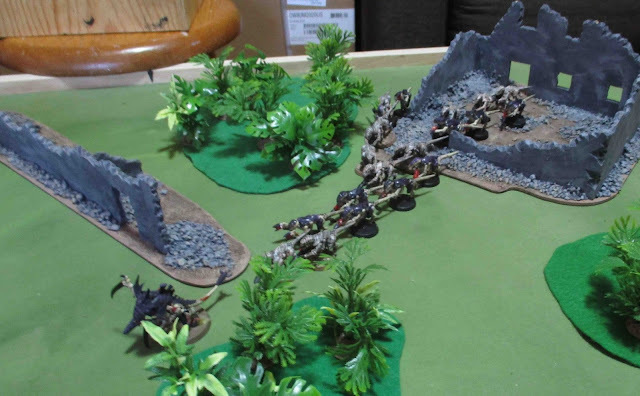 1 Section was given the "Front Rank Fire, Second Rank Fire" order which effectively makes all lasguns in the squad Rapid Fire 2 - as the Orks were now within half range that meant 24 lasgun shots! 1 Section took out one Orks with their missile team, the Flamer knock out another two and the 24 lasguns shots... took down another three. 2 Section took down another four Orks, as did 3 section. The Plasma gunner in the Command section roasted another two!? 16 Orks downed in one turn. Finnegan spent two Command Points to automatically pass his morale test (a wise move). 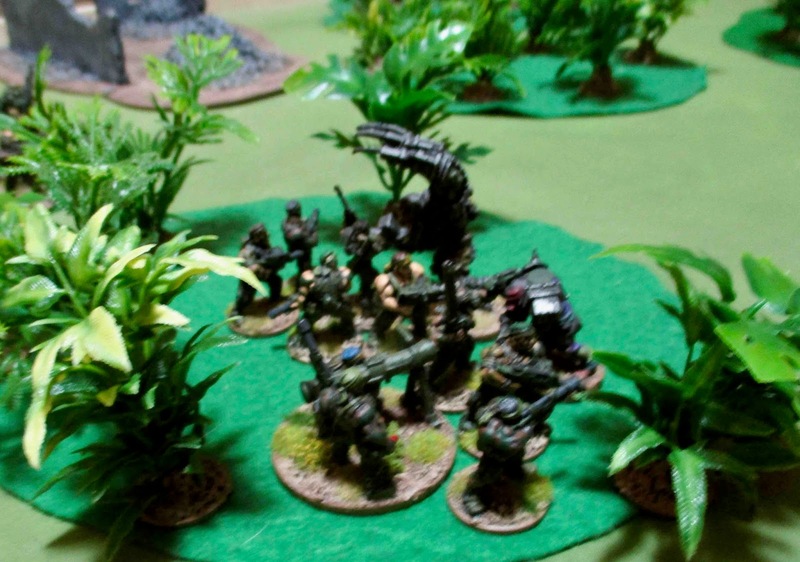 The Orks crashed into the woods with savage fury! 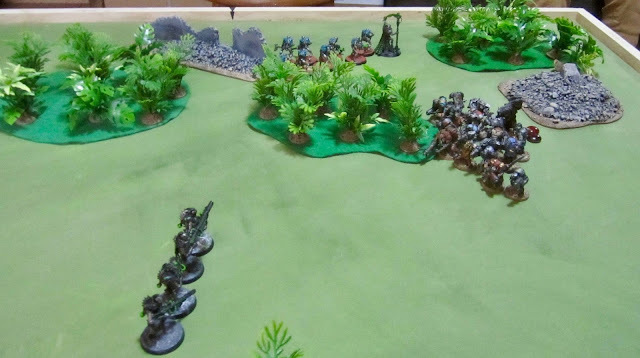 The guardsmen fired as they came on - the lasguns were entirely ineffective as stemming the green tide, at the last moment Trooper Gundstoff let off a blast from his flamer and managed to immolate two of them before the remaining few fell upon the guardsmen. Only the two biggest Orks were left, but they fought with the strength of a dozen men and a ferocity the guardsmen had never experienced. One of them - slashing wildly left and right with it's vicious power klaw, killed Troopers Jenkins, Ross and Abernathy before Sergeant Maloney tore it asunder, from shoulder to hip, with his chainsword. The biggest one - Warboss Warkurr - scooped up both Nabinda and Taft with one fell swoop and crushed them both in his might Klaw. When the dust and leaves settled, all that was left was Warboss Warkurr and five Guardsmen. I had used a Command Point to use the Vicious Traps stratagem as they charged into combat, but failed cause any wounds with it. Miraculously, my guardsmen passed morale! 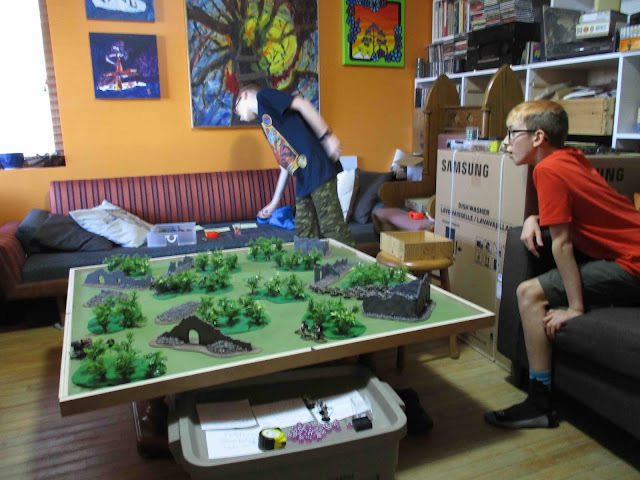 The writing was kind of on the wall at this point and we could have called it a day, but Finnegan agreed to play out another round (or two) just to see how long his warboss could survive. 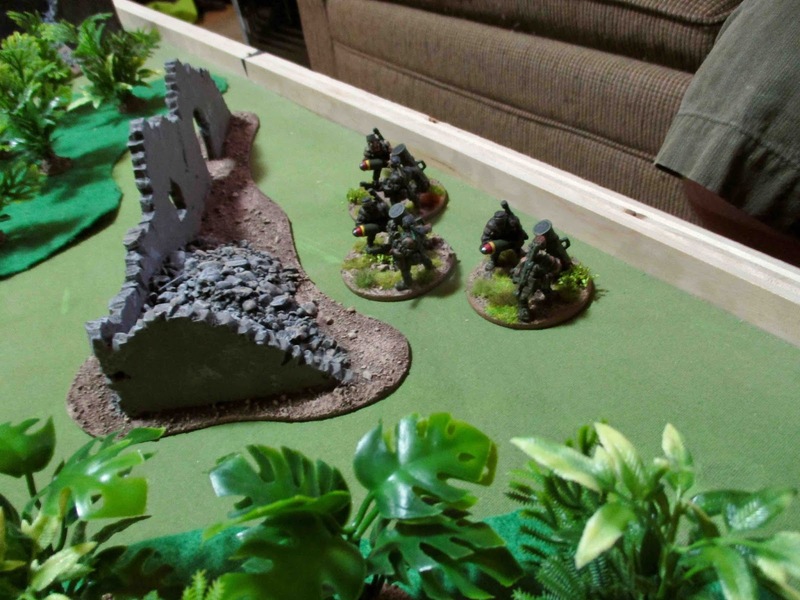 Sergeant Maloney shouted into his headset Vox-caster "FIRE ON MY POSITION!" Then he called to his men: "FALL BACK!" 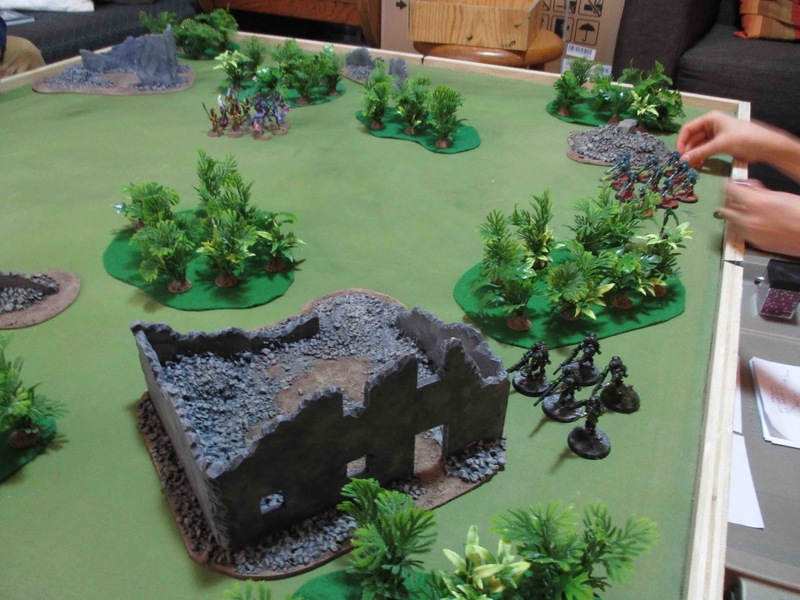 As they retreated away from the massive Ork Warboss the first mortar rounds dropped into the wood! 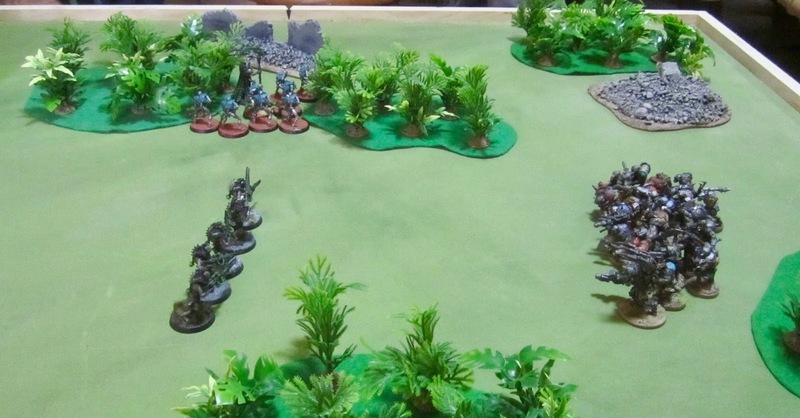 The Guard in the woods fell back from the close combat and everyone fired into the woods (I later realized I forgot to -1 to their hits for him being in cover... doooohhhh....). The mortar caused a wound. 1 Section was ordered to "GET BACK INTO THE FIGHT", which allows a unit that fell back to fire this turn. Their close up fire caused another wound. 2 and 3 Section were given the "Front Rank fire, Second Rank Fire!" order and, despite over 20 lasgun shots each (plus their Missile Launchers and Grenade Launchers) caused a total of two more wounds. On the Orks Turn Warboss Warkurr fell on the Guardsmen again. Warkurrs fire caused no casualties, the Overwatch fire was ineffective as well. I spend my last command point on another Vicious Traps stratagem - and scored one mortal wound! Warkurr took down two more guardsmen! 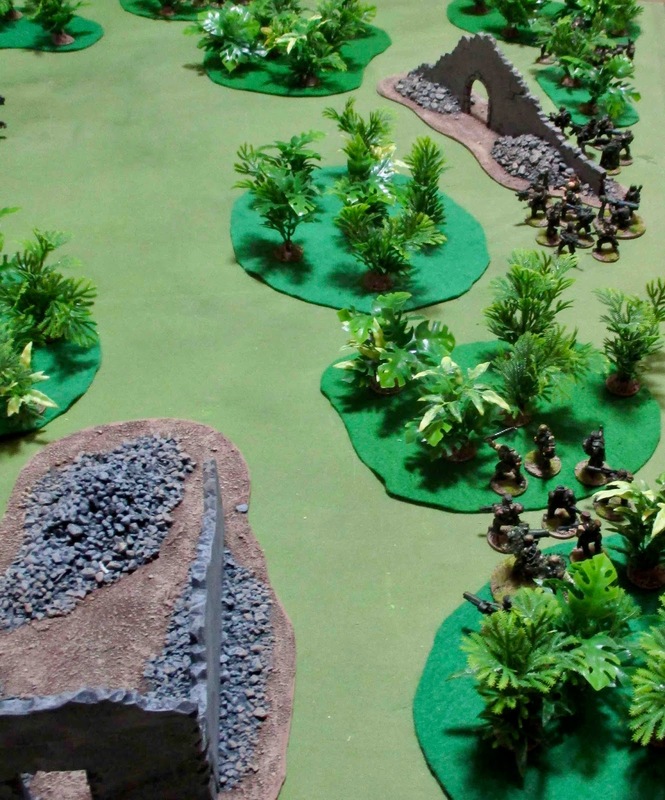 The Guardsmen passed another round. Sergeant Maloney and two other troopers came sprinting out of the woods, covered in blood and mud and soot, and they were screaming "IT'S STILL ALIVE IN THERE! KILL IT! KILL IT!" The two remaining sections poured all their fire into the woods for a full five minutes until Lieutenant Rogers called for a ceasefire. All was quite for a few minutes, save for a few rounds cooking off on the burning bodies in the woods. Cautiously 2 Section moved out and entered what remained of the stand of trees and bush, covered by 3 Section. There was nothing but bodies in that wood. Seven of their comrades lay dead - mutilated by the vicious Ork Power-Klaws. Men some of them had know and trained with for years. 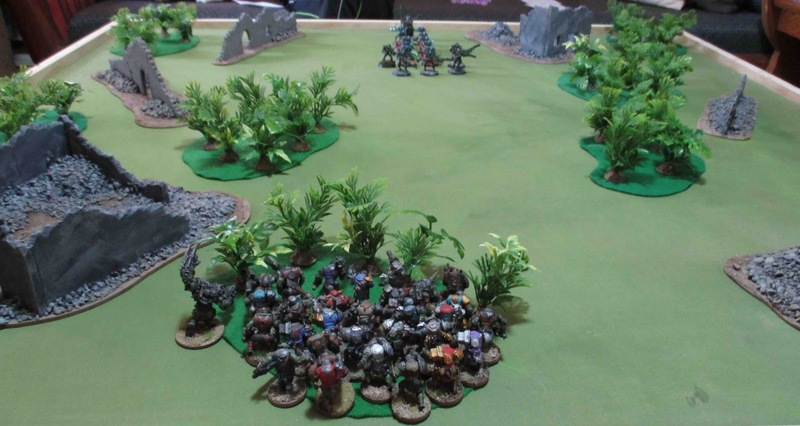 Along with their comrades were the wretched smelling Orks - a trail of thirty of them leading all the way back to the kill zone they'd originally been caught in. It was a fun and interesting game. Finnegan took the crushing defeat rather well. I honestly thought they'd have done better. Orks are BRUTAL in close combat - but the weight of fire the guardsmen can bring down on them can make it VERY difficult for them to get INTO close combat! 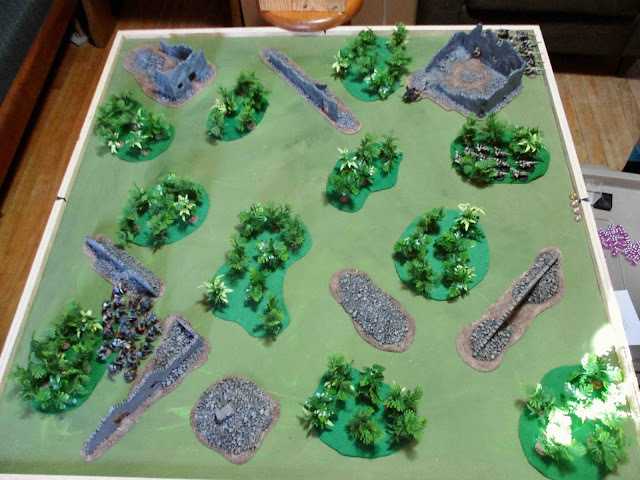 I did have some crazy-lucky rolls in the first turn or so - I couldn't stop rolling fives for all my Heavy D6 weapons (Mortars and Missile Launchers). Lasguns not super effective - but when each squad has 6 guys with them and those six guys are taking 24 shots each when they're within 12" and give the "Front Rank Fire, Second Rank Fire" order... SOME of them are going to hit and wound! The kids' friend has another day off school tomorrow and so he's coming by again. 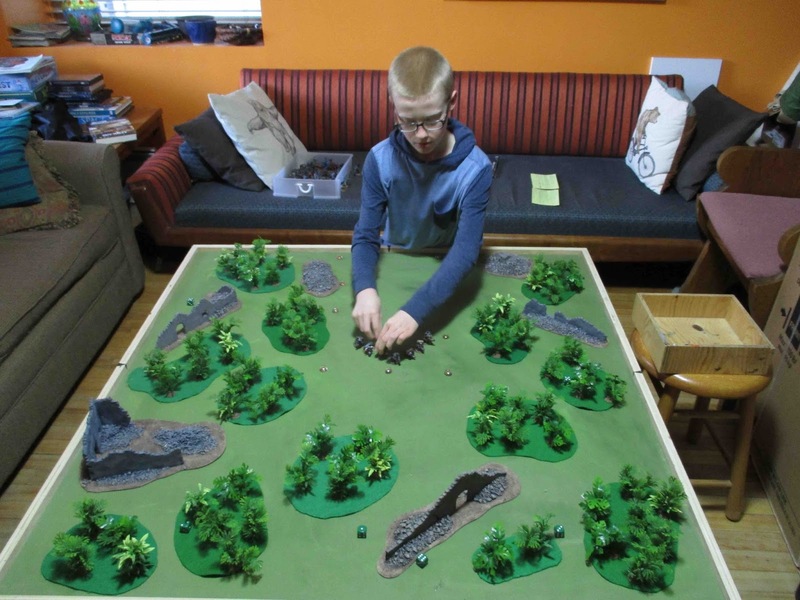 We'd originally planned to have a painting day, but he emailed over the weekend and said he'd bring some stuff to play with and this time he's bringing his Tyranids. 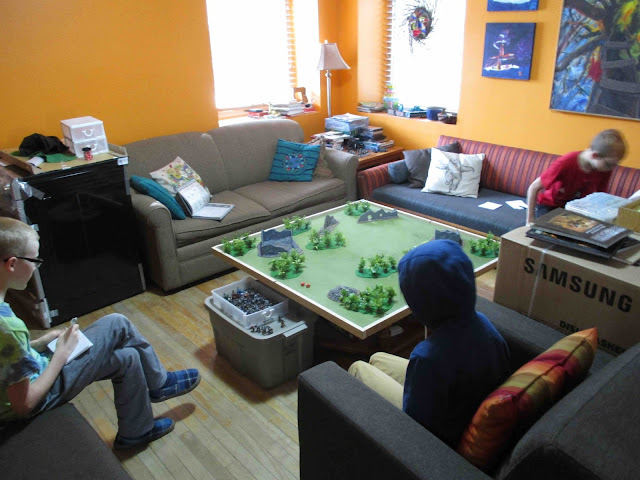 The kid's friend had a day of school on Thursday and so came over for the day to play a couple more games of 40K with us. After the previous disappointment of playing for hours and only just finishing the first turn, I suggested playing with MUCH SMALLER FORCES! I suggested the kids all come up with forces that were 15-20 Power Level, and at least 1/3 of the force should be Troops and no more than 1/3 be characters. This worked out MUCH BETTER. Not only did we play a game to conclusion - we got to play TWO games to conclusion AND everyone was engaged and having fun the whole time!! For both games we played the Ambush Scenario. It seemed like one that could be played at a lower power level and had an objective other than simply utterly destroying you opponent - although, that is an option, I suppose... The attacker sets up around the fringe in cover, then the defender sets up in some relatively open space. 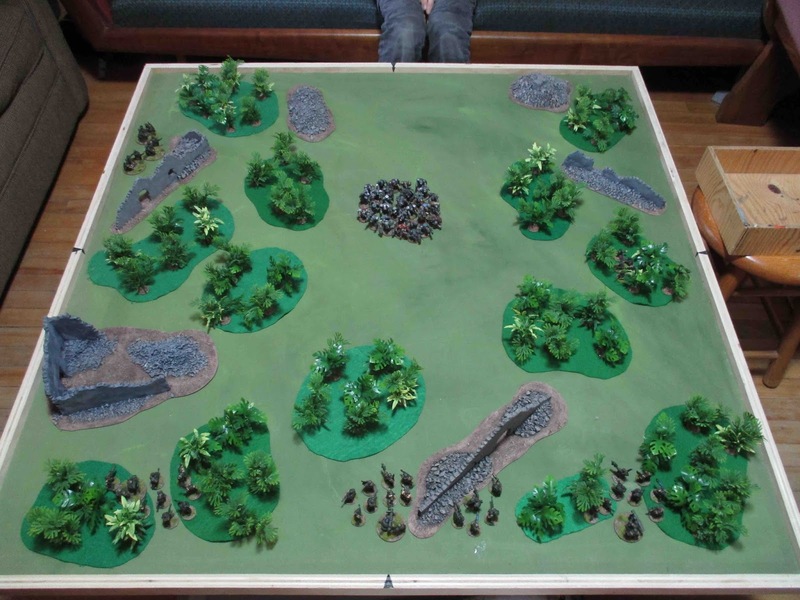 If the defender can get units of Power Level (regardless of how many are actually left in the unit) equal to one third of his force or greater off the far end of the table they win. We discussed the relative strengths and weaknesses of the two forces and decided it would probably be a lot harder for the Orks to attack as they had fewer units and the Necrons could slip past on one flank or the other. After this we decided to roll for it. Necrons won and decided to defend. 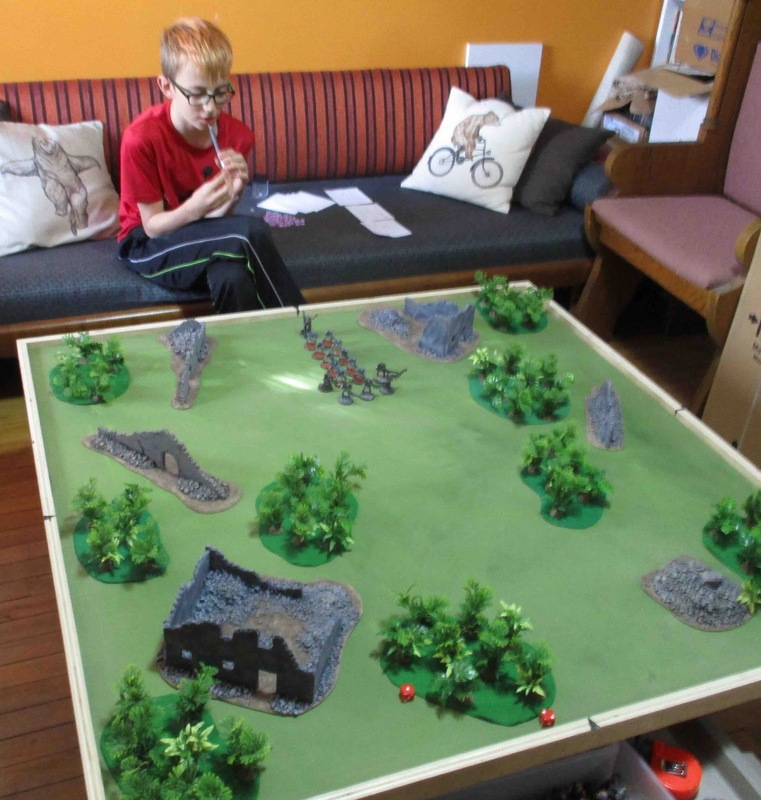 The table we used for both games. The relatively open area to the left of centre is the defenders set up area. General J.O.E. plots his escape from this ambush. 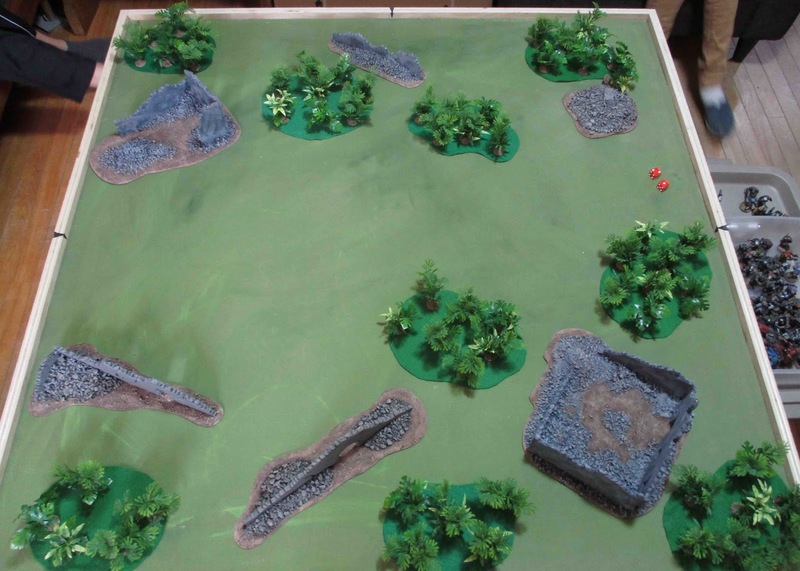 The attacker sets up some hidden deployment markers to start with (the red dice #1 and #2), then the defender sets up in their deployment zone. The Orks then sets up their forces around the appropriate deployment marker. The Orks moved up to the front edge of the woods they were hiding in and lit up the Necrons... well... most of them lit up the air and ground in front of the Necrons, but the Big Shootas were actually in range and scored a few hits taking out two of the Necron Warriors. ...and on the Necron turn those two warriors came back (Ugh... Necrons... they're like a bad case of herpes... Mechanical Space Herpes!). They then slowly began to trundle up the table, shooting as they went. The Deathmarks managed to tag one of the Ork Boyz. The Necron warrior did not get up again thus preventing this game from turning into a song by Chumbawumba. The Necrons continued their ponderous advance blazing away with their pew-pew guns. Their shooting was a touch more effective, taking down three more Boyz. More of the same - except the Warboss and some of the Boyz with Shootas got in on the action... though the Orks, with all that extra shooting, still only knocked one Necron Warrior down. On the Necrons turn one of the downed warriors got back up again (officially turning the game into a song by Chumbawumba...). Realizing this game was likely half over and his troops were barely at the middle of the table, Overlord J.O.E. started to lead his Herpes... I mean... Warriors off to the flank - but not so fast they couldn't shoot up five more Orks. The Orks chased after the Necron Warriors, blazing away in all directions! someone managed to kill one of those pesky Deathmarks that were harrying them. 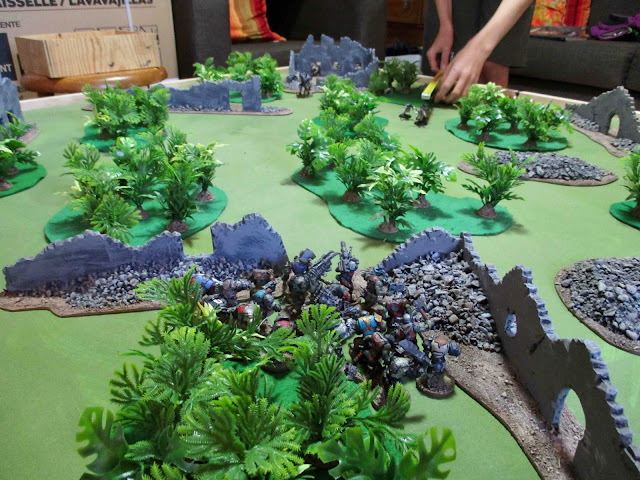 Well... that was a little anti-climactic, so everyone decided to play another round "just to see"
The Ork mob surged forward and unleashed some terrifying close range fire! Their prep fire alone took down five Necron Warriors. Nekron Overwatch fire took out one Ork, which was just not enough to stem the green tide. The Orks utterly wiped out the remaining Necron Warriors - before they even got to finish all their attacks. The Overlord had done a "Heroic Intervention" and joined the fray. He even spent a two Command Points to fight before the Warboss. While he (it? it's a robot right?) scored three hits, not one wounded. Finnegan figured he swung his big green scythe and the warbles grabbed it in his Power Klaw. Then the Warboss hit back and landed some telling blows with the aforementioned Power Klaw - scoring FOUR WOUNDS! OUCH! (or not... because it's a robot, right?). Still... that's got to leave a mark. 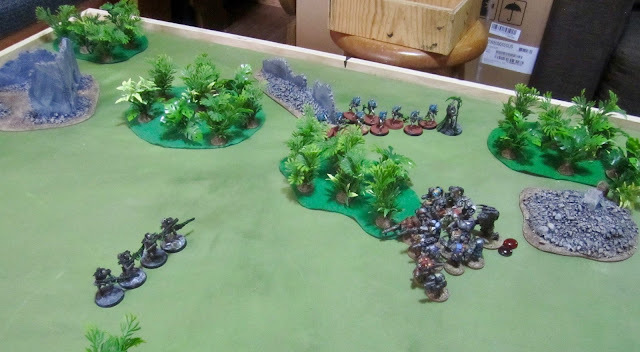 Same as before, except this time the Necrons were attacking and the Eldar were defending. All set up and ready to go. Learning from the previous game, The Girl decided he best option was to set up as close as possible to the far end of the table and SPRINT for it! The Necrons decided to spend a Command Point to keep the dark rules going for an additional turn. I'm not entirely sure why, as THEY are the ones with long range weaponry...? But spend them they did. They also spent two do have two of their units ignore the dark rules for a turn. And so to start off the game they rained down withering pew-pew gunfire on the Eldar. Millim was grazed in all this and stumbled and broke a nail and had to tell the rest of the troope she was out for this one and wandered off. 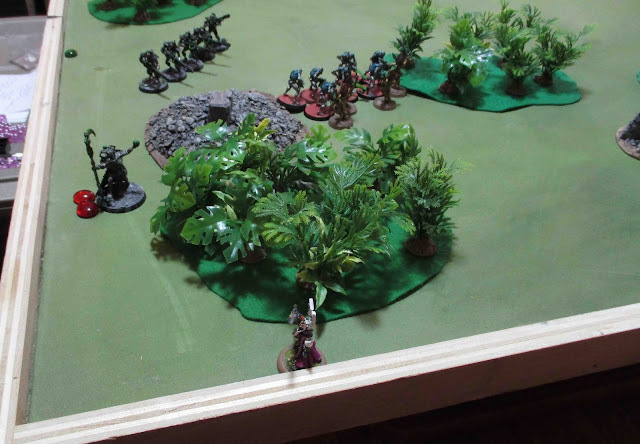 On their turn, the Eldar didn't wait around - all moved and advanced as quick as they could for cover on the flank and to make for the escape route! Overlord G.E.O.R.G.E. was utterly confused by this move and chased (well... trundled after them). The Warriors got far enough around the corner that they had a Harlequin in their sights and shot them up - causing FOUR WOUNDS - Leaving Rallensha alone to carry out whatever mysterious mission they were tasked with carrying out. 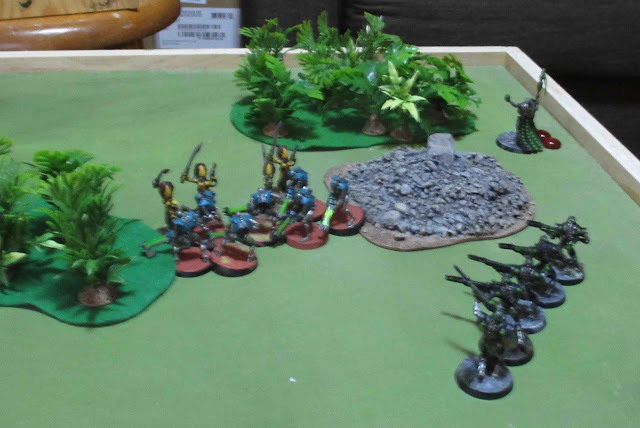 The Harlequins checked morale - not a big concern, they'd only fail on a 6... which is, of course, precisely what The Girl rolled (thank goodness for Command Points and re-rolls!). Rallensha thought about it a moment and decided "THE SHOW MUST GO ON!" So on the Eldar turn, Rellensha, the sole remaining Harlequin took off like a bat out of hell and hauled flip-belt for the escape route. 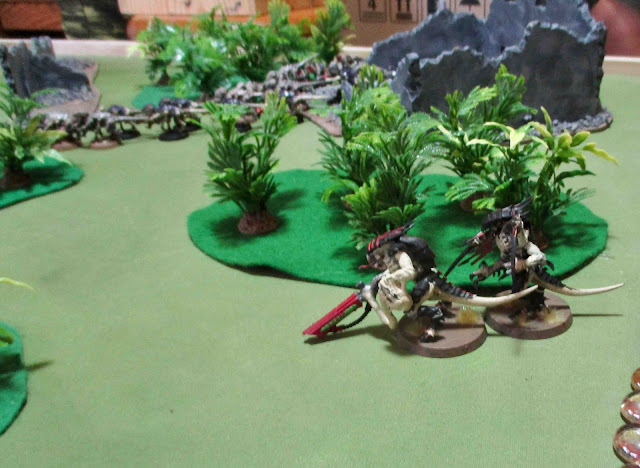 The Farseer wasn't far behind her, and conjured up some Smiteness to blast away one of the Necron Warriors. The Howling Banshees moved up and fired off their shrunken pistols and took out another Warrior (they'd actually caused FOUR wounds with their five shots, but the Necrons saved three). They declared their charge, dodged all the Necron overwatch shots and in they went. howling Banshees, WS 3+, 10 attacks... took out one Necron... The Necrons fought back and Khara stubbed her toe and decided to call it quits for the day. They still took out one Necron Warriors. Or perhaps they were just tipping them over like cows or something... The Necrons didn't manage to score any wounds. It was like they were having some girl-eldar-robo-slap-fight... I don't know. 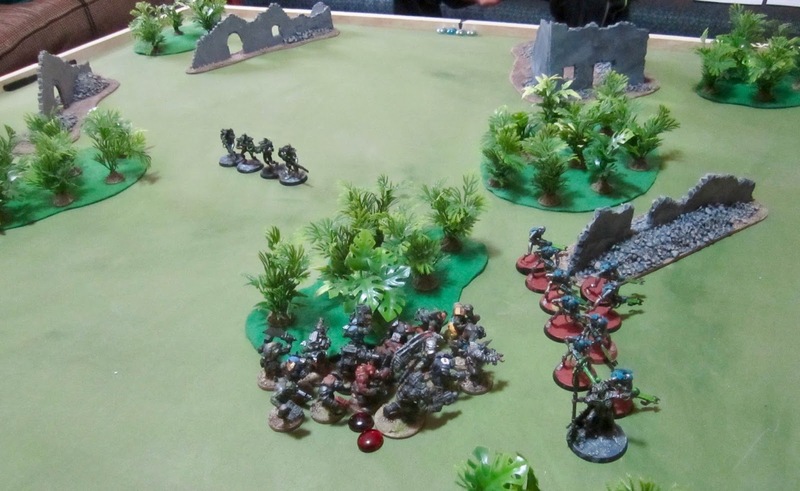 On the Eldar turn the sole Harlequin scarpered and that effectively won the game for the Eldar. They decided to play it out. the Farseer moved up and blasted General G.E.O.R.G.E., Necron Overlord, with some smite and caused two wounds. She also shot at him with her Shining Spear, but it saved those wounds. the Banshees and the Necron Warriors kept up their slap fight shouting "STAAAAAWWWWP! STAAAAAWWWWP! " at each other. The Overlord moved and shot at the Farseer, causing one wound, Then charged into close combat in a desperate bid to try and stop her from getting off the table as well! 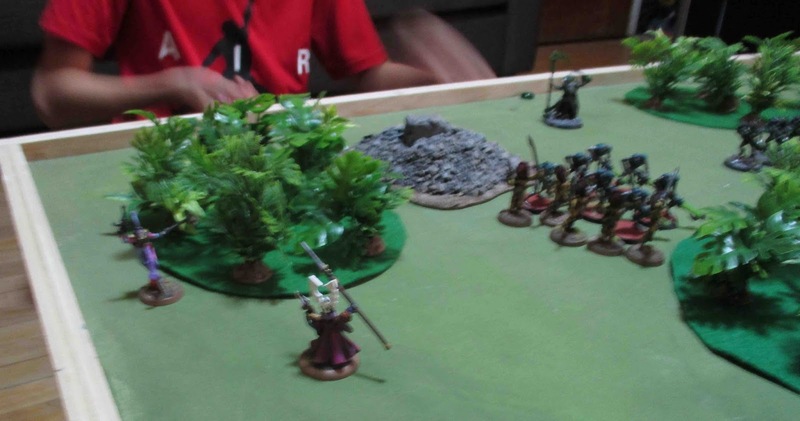 On the Eldar Turn the Farseer danced out of combat and off the table edge. As I said at the beginning this worked out WAY better than last time! Everyone stayed engaged and excited about the game and were super stoked to actually FINISH a game! I'm hoping over the weekend I can get the kids to have battle with me and my Power Level 18 force (I did have one ready, just in case we got through two games and had time to spare...). The kids friend has another day off skewl on Monday so he's coming over again, but I think we're going to set up for a day of painting! Another Special Weapon Squad for the Tallarn force. Up next I should have a Catachan/Guaiacan Heavy Weapons team.